Let’s be Accurate – It’s DemocratCare, not ObamaCare. Look who is giddy about the Affordable Care Act fiasco – no Republicans present. 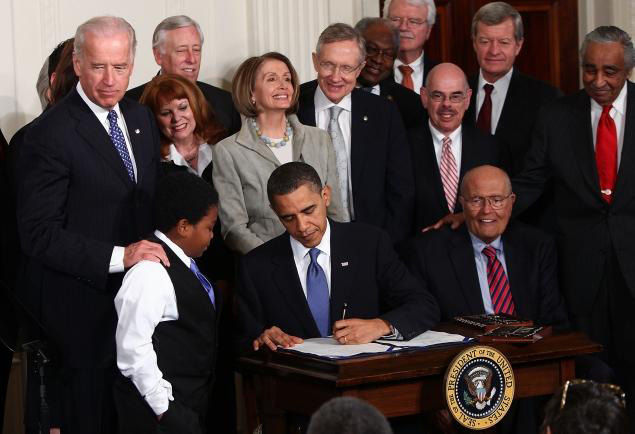 On December 24, 2009 the U.S. Senate passed the Patient Protection and Affordable Care Act. All 58 Senate Democrats voted for the new health care law. Not a single Republican senator voted for this destructive law. On March 21, 2010 the U.S. House passed the Senate’s version of the Affordable Care Act with 219 House Democrats voting for it. Not a single House Republican supported this bad law. Two days later, Democrat President Barack Obama gave his seal of approval and signed the health care bill making it the law of the land. Democrats are the only ones responsible for this disastrous law. And remember when the President promised over and over again ” If you like your doctor you will be able to keep your doctor – period. If you like your health care plan, you will be able to keep your health care plan – period. No one will take it away no matter what.” Remember what candidate Obama promised the American people in 2008 in exchange for the votes that brought him to power: “And if you already have health care then we’re going to reduce costs an average of $2500 per family on premiums.” Who believed such a fantastic promise? Who wanted us to believe it? Now the American people are paying dearly for the folly of DemocratCare. The Democrats will pay for it dearly at the next election. Dear Tom Udall, I hope the wise people of New Mexico give you what you deserve next year – an opportunity to find a new line of work. This entry was posted in CURRENT EVENTS and tagged 2009, Affordable Care Act, December 24, DemocratCare, Liberalism's Failure, ObamaCare, ObamaCare Navigators, Tom Udall by eburke93. Bookmark the permalink.